The tabla is a popular Indian percussion instrument used in Hindustani classical music and in popular and devotional music of the Indian subcontinent.The tabla consists of a pair of hand drums of contrasting sizes and timbres. The term ‘tabla” is derived from an Arabic word, “abl”, which simply means “drum.”It was invented in India, and according to legend, the13th century Indian poet Amir Khusrau split the single drum into two parts. There is a saying, “toda, tab bhi bola – tabla” which means, “When broke, it still spoke”.The smaller drum, played with the dominant hand, is sometimes called dayan (literally “right”), but is correctly called the “tabla.” The larger drum, played with the other hand, is called bāyāñ (literally “left”). Both drums are covered with a head constructed from goat or cow skin. The head is affixed to the drum shell with a single cow or camel hide strap laced between the braid of the head assembly and another ring placed on the bottom of the drum. 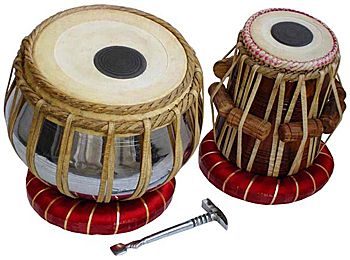 For stability while playing, each drum is positioned on a toroidal bundle called chutta or guddi made of cloth. Nupur Academy training in tabla emphasizes rhythm and technique as well as developing a comprehensive Classical performance style as for both music and dance. Below are photographs from our tabla classes and performances.